The first line would end with a period / full stop (。) if this were prose. It's copy, and is probably imitating the rhythm or fluidity of spoken Japanese. 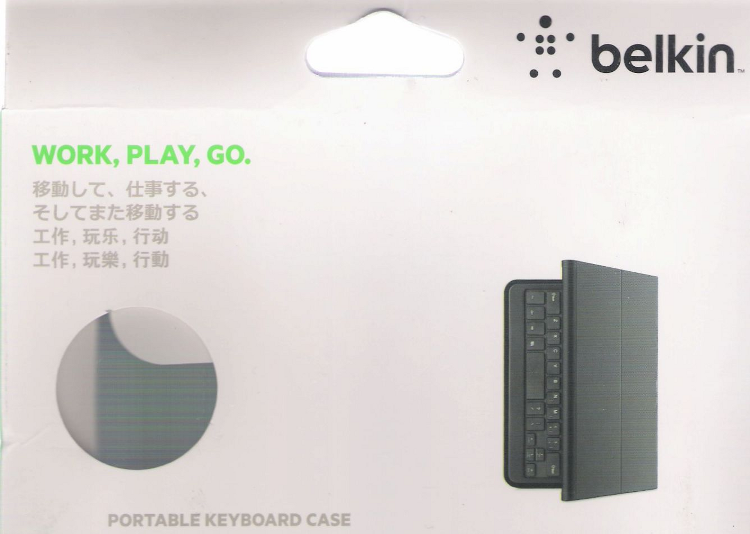 I suppose what caught your attention was that the Japanese copywriters didn't want to suggest that their buyers would do something so frivolous as playing — no, they work all the time! i find this a little less surprising than the multilingual Ikea battery handling pamphlet i had the joy to study in detail a month ago. apart from the Japanese text having many problems, the so-called 'traditional' and 'simplified' Chinese texts were entirely disjunct and set in different typefaces. they went far beyond what you would expect in differences between Taiwan and the Mainland; even the register was slightly different, with the 'traditional' being in fact much less colloquial in style and more going into 'classical written Baihua' if indeed there is such a thing. while such differences may even be justified to a certain degree considering the reading and writing habits of the two locales, i was still left with an impression of sloppiness. it really does look like Ikea does not have the money to pay someone with a minimal command of a subset of the languages involved. instead, some original text is presumably handed out down a chain of subsubsubcontractors that do not and can not know of each other (i remember a professional translator telling me in the 80s that whenever he got the next FAX with some job for them, he could tell from the long row of timestamps and telephone numbers on the scroll that he was pretty much down at the end of the food chain). this is awkward, given that almost anyone native in one of the translations would also be able to parse major parts or all of the other one. same goes for the above picture: stupid marketing folks may assume that "oh this is English, they can't read that here, these people speak traditional Chinese [sic] / simplified Chinese [sic] / Japanese". in fact, many people in the 漢字文化圈 / 汉字文化圈 / 漢字文化圏 Sinosphere, especially in the cities, will be able to readily understand (major parts of) all four versions. i'm really wating for an instance of a slogan in 'traditional' repeated in 'simplified' where each character looks identically (and maybe the font faces in some teensy details differ, which would make it even more horrible). @flow: That's not sloppiness, that is the marketers realizing that simplified and traditional Chinese have different terms for many concepts, and (more importantly) the users of the two scripts have very different expectations for marketing text. As you say, the register for traditional Chinese tends to be higher and more classically-influenced. The simplified text will likely read as inappropriate to a Taiwan or HK audience. Frankly, seeing copy where the traditional text is just the simplified run through a converter (and, given the market size difference, it is almost never the other way around) will be pretty damaging to my impression of the company as a Taiwanese person. It shows that they're not even willing to target the Taiwan market properly. Not sure of the point Prof. Mair is not commenting on. The English translation of the Japanese is the most poetic of the three, and emphasizes movement. To my ears, it's the one that sounds least like advertising bumph. "Work, play, action": what, work and play aren't actions? Similarly, "Work, play, go": and by "go" they mean what, travelling between work and play? Is "go" coded approval of texting while driving? @John believe that if you're believer, but my impression is that neither the folks who did the above nor the ones that did that IKEA pamphlet gave many thoughts to language. they're just executing a script that says, make one copy for each of the countries we're gonna place this stuff. and there they go. you'd probably be a bit more with me if i were able to show you the Japanese version, which looks like someone tried and got their notes down already, but never finished. this is not like someone said, ok, let's make one vernacular version for those people out there in Peking and Shanghai, and let's try to be very classy for the folks in Taipei. they paid one guy for one version, and another one for the other, and no-one ever got to read both.